To obtain a 100% complete drying result, the products can be transported through the drying tunnel. Required for this is, that the majority of adherent water on the products, has been removed by the airblow section in the first instance. In the drying tunnel, the products pass through several blowing openings, from which heated air of about 100 ° is blown. 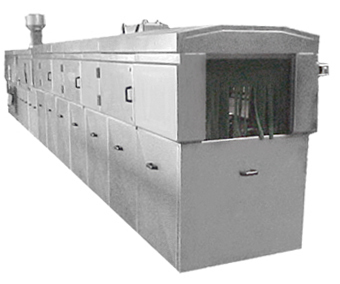 The drying tunnel is fully insulated and has adequate inspection hatches. Do you want to talk about the Drying tunnel? You want more information about Drying tunnel?